Google has announced that it's adding select app activity to search, and some of music's most popular services are part of the launch. In the coming weeks, if you Google a site or app on (and that app has integrated with Google+ Sign-In app activities), you'll see popular and aggregate user activity to the right of the search results. 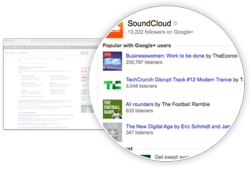 Searching for Songza, for example, will show the top playlists among Google users. Google is starting with a limited number of music and movie apps, includingDeezer, Fandango, Flixster, Slacker Radio, Songza, SoundCloud and TuneIn, but will be adding more apps over time, according to Seth Sternberg, Director of Product Management, Google+.